In the first half of the Twentieth Century, a movement arose to provide moderately priced housing for a rapidly growing urban population and find answers to the problems created by the emerging automobile culture. The first planned communities that were developed in response to these pressures were constructed in the eastern United States. They gave rise to planning theories that came to be known as the "Greenbelt Movement". It was the desire to build such a community on the West Coast that inspired creation of Baldwin Hills Village, now known as The Village Green. A search was begun for a piece of relatively flat, underdeveloped land close to metropolitan Los Angeles, where the new planning theories could be implemented. The search ended in 1935 with the selection of the present site, once a part of the original Rancho Cienega land grant from the King of Spain. E.G. "Lucky" Baldwin had purchased the property through his daughter and lent his name to the project, which became known as Baldwin Hills Village. Conceived as a refinement of the earlier greenbelt planning, Baldwin Hills Village was developed around the ideas of the superblock. The original plans called for a block of eighty acres (although only sixty-eight were actually developed) undivided by through streets, so that pedestrian and automobile traffic would be separate and residential units would face open green spaces. After much planning, a group of architects, headed by Reginald D. Johnson, began in 1938 to secure the necessary city and federal approvals for the project. This involved getting the property annexed to Los Angeles in order to obtain city utilities. In time, ninety-five buildings emerged on the drawing boards. They contained sixty hundred twenty-seven units (two more units were added later) that represented sixteen different floor plans. Forty-four of the sixty-eight acres were are still hare devoted to greens and garden courts. The low density of 9.2 residential units per acre remains rare for housing so close to the city center. Construction began in 1941, starting from Sycamore Street and moving west. When Baldwin Hills Village was completed the following year, the country was at war. Housing was in short supply due to the war effort so units rented quickly, and the Village soon reached one hundred percent occupancy. ﻿Baldwin Hills Village was sold by a member of the Baldwin family to Terramics Associates in 1972. The new owners announced the conversion of the development to condominiums and changed its name to "The Village Green". Conversion proceeded from the western end of the property. It was completed under a second developer (thus explaining the various "phases"). The first unit was sold in 1973. The Village Green Owners Association and its elected Board of Directors assumed management of the completed complex in 1978 after the sale of the final unit. 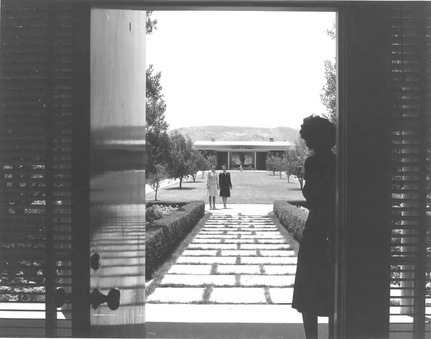 In 1946, when Baldwin Hills Village was only four years old, the Museum of Modern Art in New York named it one of the most significant works of architecture in the nation. The same year, it won a distinguished honor award from the Southern California Chapter of the American Institute of Architects. 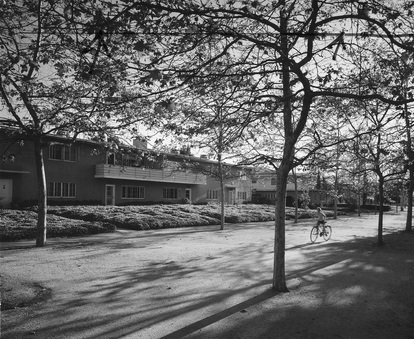 In 1972, the AIA honored the Village Green with its twenty-five year National Award for Excellence. Four years later, in the year of the U.S. Bicentennial, the AIA listed Village Green among the architectural accomplishments of the most enduring significance in U.S. history. The Village Green won yet another award during the condominium conversion. The Cultural Heritage Board of the City of Los Angeles recognized it officially as Historic-Cultural Landmark No. 174 in 1977. In May 1990, The Village Green began a two year observance of its fiftieth anniversary. The occasion was marked by a week-long celebration during which Los Angeles City Councilmember Ruth Galanter presented plaques recognizing both The Village Green and Robert Alexander, the last surviving architect of the project. The week culminated with a presentation in which Mr. Alexander outlined both the design concepts and the history of the experiment that the architects had originally called "Thousand Gardens." During his visit, Mr. Alexander consulted with homeowners regarding presentation and application for the National Register of Historic Places, a special program of the U.S. Department of the Interior to recognize and preserve the most valuable contributions to the nation's cultural heritage. The Village Green was added to the National Register of Historic Places in 1993, and was designated a National Historic Landmark in 2001. National Historic Landmarks are nationally significant historic places designated by the U.S. Secretary of the Interior because the possess exceptional value or qualify in illustrating or interpreting the heritage of the United States. Fewer than 2,500 historic places bear this national distinction. The Village Green continues to be both a desirable place to live and a destination for students of architecture, landscaping, and urban planning. The distinctions it has garnered in its more than seventy years of existence are a tribute to the innovative planning of architects who conceived it.